Leziate is a large parish in the west of the county, and includes the small hamlets of Leziate and Ashwicken. Leziate comes from the Old English meaning ‘meadow gate’. Ashwicken is also derived from Old English and means either ‘place at the dwellings or buildings’ or ‘place at the ash trees’. The earliest finds from the parish are three Palaeolithic flint flakes (NHER 3332, 16826, 19425). Other prehistoric flints (NHER 28351) have also been found, including a Mesolithic flint blade that was re-flaked during the Neolithic period (NHER 28389), Neolithic axeheads (NHER 3378, 11248, 14798, 14799), a knife (NHER 3380), arrowheads (NHER 11609, 44230), a scraper (NHER 30489) and other flint implements (NHER 3379). A large Bronze Age bowl barrow (NHER 3381) has survived as an earthwork mound on Leziate Heath. To the south of the barrow is the site of a penannular enclosure (NHER 11694), which is visible as a cropmark on aerial photographs. The exact date of the enclosure is unknown, although it may date to the Bronze Age. The cropmark of a ring ditch (NHER 12824), probably the remains of a Bronze Age barrow, has been recorded near Well Hall Lane. The only Bronze Age find from the parish is a flanged axehead (NHER 11347), and fragments of late prehistoric pottery (NHER 28351) were recovered during fieldwalking carried out by the NAU before the creation of Bawsey golf course. Although no Roman settlement sites have yet been identified, there is evidence of industrial activity during the Roman period. 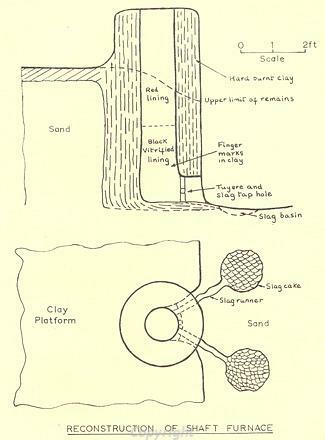 A Roman iron-smelting site (NHER 3382) was excavated in the 1950s between Holt House and Hundred Acre Plantation. The excavation revealed several shaft furnaces that were dated to the 2nd century. Some evidence of smithing activity was discovered, although iron artefacts do not seem to have been produced on the site. A geophysical survey was carried out on the site in 1998, revealing several potential archaeological features. 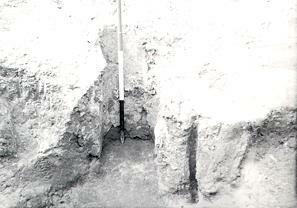 These features were excavated by the NAU in 1998 and 1999 and were found to be medieval to post medieval ditches as well as other ditches of unknown date (NHER 3382 and 34086). The iron-smelting site is close to the Roman settlement at Blackborough End in the parish of Middleton. The site is close to an area of intense industrial activity, and 3rd century furnaces have been found close to the nearby Roman settlement. The site of a Roman building (NHER 3734) was excavated near Church Lane in the 1950s. A large amount of Roman building material, including tiles and tesserae, has been recovered from the site. Roman finds from the parish include two querns (NHER 3383, 12190), fragments of pottery (NHER 3384, 38183) and coins (NHER 17307, 28134). A 2nd century AD Roman iron smelting furnace excavated in the 1950s at Leziate. During the Late Saxon and medieval period settlement in the parish was more widespread than it is today, and the two villages of Holt and Gloresthorp have vanished from the landscape. Fragments of Middle Saxon pottery (NHER 3384) and Late Saxon pottery (NHER 3384, 16513, 28351, 35987) have been found during fieldwalking. Holt House (NHER 44229) is a late 17th or early 18th century carrstone house that stands on the site of the medieval village of Holt (NHER 3402). Holt disappeared when its notorious landlord, Thomas Thursby, enclosed the land and converted it to pasture for his sheep flocks. A Commission of Inquiry was set up in 1517 to investigate the relationship between enclosure and conversion to pasture and the depopulation of villages. Holt was the only village in Norfolk to be recorded by the Inquiry totally depopulated in this way. In 1086 the Domesday Book recorded that Roger Malet held Glosthorp, or Gloresthorp, which had two mills and woodland as well as an outlying manor in Bawsey. In the 14th century the village of Gloresthorp (NHER 3405) was recorded as having a manor house and two watermills. A complex of linear cropmarks (NHER 16291) is visible on aerial photographs around the site, and these have been interpreted as part of the medieval village. The site of another small medieval settlement (NHER 38183) was discovered during a fieldwalking survey to the south of Hundred Acre Plantation. In 1086 Leziate was also held by Roger Malet. The holding was quite small, with two freemen, one smallholder and a mill. Ashwicken was divided into two holdings, with meadows, a mill and a salthouse. The medieval village of Leziate was once much larger, but the village had shrunk sufficiently by the late 15th century for the parish of Leziate to be united with Ashwicken. All Saints’ Church (NHER 3409) in Leziate was in ruins by the 17th century, and there are now no upstanding remains of the building, although medieval building material, floor tiles and human remains have been found on the site. Pottery dating from the Late Saxon to the post medieval periods and a medieval casket mount (NHER 14772) have been recovered from the fields surrounding the site of the church. All Saints’ Church (NHER 3416) in Ashwicken dates back to the 13th century, and has a west tower with a pyramidal tiled roof. The church was restored in the 19th century and the chancel and the south porch were completely rebuilt. The modern village of Ashwicken is also much smaller than its medieval predecessor. The remains of part of the medieval village were visible as a complex area of earthworks (NHER 16290) between East Winch Road and Ashwicken Hall. The earthworks were destroyed by ploughing in the 1990s. Ashwicken Hall (NHER 11979) stands on the site of a medieval moat. The moat was filled in during the 19th century when the Hall was also substantially rebuilt. A field near East Farm is the possible site of a medieval hall (NHER 11832). The field is marked as Old Hall Close on the Tithe Map of 1843, and a medieval gilt and copper alloy rowel-spur has been recovered from the site. In 1843 a medieval tile kiln (NHER 1075) was excavated on the banks of the River Gaywood. A large number of medieval tiles, pottery and kiln waste have been recovered, and the tiles have become known as ‘Bawsey tiles’ as the site straddles the parish boundary. An earthwork mound (NHER 3386) was recorded in 1949 in a field near Church Lane. The mound, which has since disappeared from the landscape, may have been associated with quarrying that took place on the site, or it may have been a mill mound. Medieval pottery (NHER 3384, 3385, 16513, 35987, 40337), seals (NHER 12208, 28357) and coins (NHER 28357) have been found during metal detecting and fieldwalking, as well as a sword pommel (NHER 35987) and a 13th century buckle plate decorated with a dragon (NHER 28955). During the post medieval period Leziate Fen was used as a source of peat (NHER 25283), a practice that may have continued into the 20th century. Leziate brickworks (NHER 3414) is shown on 19th century Ordnance Survey maps. The brickworks, which finished production in the 1920s, had a wire-hauled railway connecting the pits to the brickyard. A 19th century brick kiln (NHER 3415) is shown on an Ordnance Survey map of 1883 on East Winch Road. Sarah Spooner (NLA), 19 April 2006.